← Just wondering about a life-changing encounter. The squiggly red line of social erasure. International educators may be particularly aware of the importance of language, seeing as so many of us toggle between multiple languages in our everyday lives, and teach children who do the same. We’re privy to the delight of discovering a useful word with no translation to our first language/s. I still use yella (Arabic for let’s go/come on/hurry up! ), though I left Kuwait years ago. Or, we’ve experienced the profound feeling that language, when mastered, can shape even the way that we think, such as when the grammatical gender of nouns, according to different languages, changes how people personify them. Language can also lend validity to our experiences; I remember the unexpected sensation of relief when I acquired the term TCK (Third Culture Kid or Trans-Cultural Kid), and could then put words to an identity I strongly related to, but hadn’t previously been able to articulate. Language, and the ability to use it to reflect our lived experience, matters. Widespread – Below you’ll see the word used in peer-reviewed, academic texts published across fields as varied as health, parenting, education, religion, law, business, public recreation, and architecture. Sustained – At least one detailed explanation of the term (with visual diagram, below) dates back to a peer-reviewed journal article from 2009, almost a decade ago. Meaningful – Discrimination based upon gender identity is deadly and serious; recognizing it by name is meaningful. From the same interview, Stamper provides an example of a word she chose to add to the dictionary: bodice ripper (it’s a type of romance novel, for those unfamiliar). Other words you can find in Merriam-Webster’s tome: dumpster fire, f-bomb, ginormous, weak sauce, glamping, anyways, and literally (when used in exaggerated emphasis, not actually meaning, well… literally). 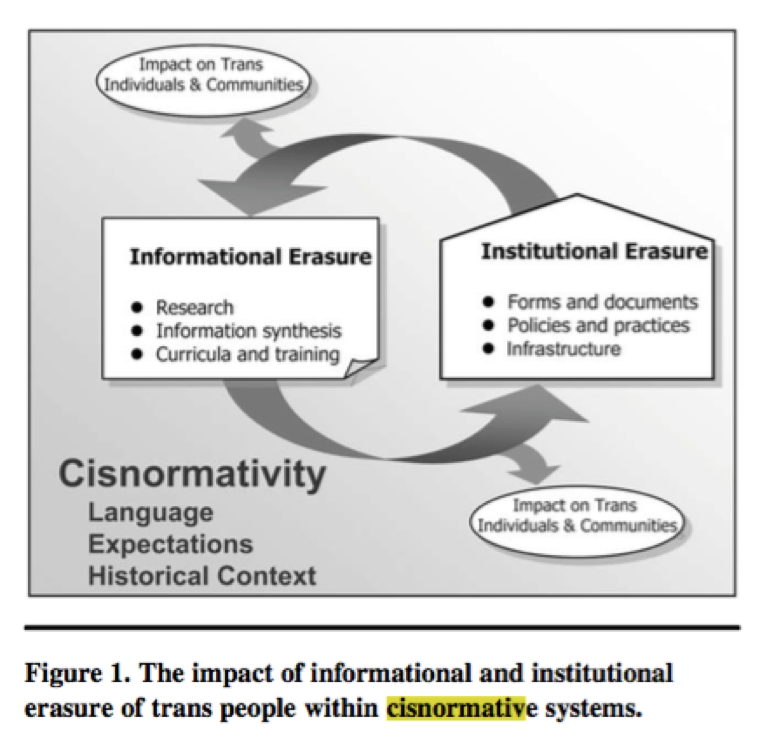 I’d argue any day that cisnormative is at least as credible a word as these. I will be asking Merriam Webster dictionary to consider adding to their tome the word cisnormative (and related word, cisnormativity). I don’t want to see the squiggly red line throughout my Word documents anymore, invalidating the lived experience of transgender, non-binary, and gender non-conforming children who are marginalized by widespread, sustained, and meaningful cisnormative social norms. Readers, I invite you to add a sentence using the word cisnormativity in the comments of this post, to include in my submission to Merriam-Webster. Segel, E. & Borodistsky, L. (2011). Grammar in art. Frontiers in Psychology, 1, Article 244. Bauer, G. R., Hammond, R., Travers, R., Kaay, M., Hohenadel, K. M., & Boyce, M. (2009). “I don’t think this is theoretical; this is our lives”: How erasure impacts health care for transgender people. Journal of the Association of Nurses in AIDS Care, 29(5), 348-361. Oakleaf, L. & Richmond, L. P. (2017). Dreaming about access: The experiences of transgender individuals in public recreation. Journal of Park and Recreation Administration, 35(2), 108-119. Worthen, M. G. F. (2016). Hetero-cis-normativity and the gendering of transphobia. International Journal of Transgenderism, 17(1), 31-57. Rhodes, C. (2017). Ethical praxis and the business case for LGBT diversity: Political insights from Judith Butler and Emmanuel Levinas. Gender, Work and Organization, 24(5), 533-546. Jones, S. M. & Willis, P. (2016). Are you delivering trans positive care? Quality in Ageing and Older Adults, 17(1), 50-59. McGuire, J. K., Kuvalanka, K. A., Catalpa, J. M., & Toomey, R. B. (2016). Transfamily theory: How the presence of trans* family members informs gender development in families. Journal of Family Theory & Review, 8, 60-73. Sharpe, A. The ethicality of the demand for (trans)parency in sexual relations. Australian Feminist Law Journal, 43(2), 161-183. Clarke, V. & Demetriou, E. (2016). ‘Not a big deal’? : Exploring the accounts of adult children of lesbian, gay and trans parents. Psychology & Sexuality, 7(2), 131-148. Sumerau, J. E., Cragun, R. T., & Mathers, L. A. B. (2016). Contemporary religion and the cisgendering of reality. Social Currents, 3(3), 293-311. Castricum, S. (2017). When program is the enemy of function… Gender-nonconforming experiences of architectural space. Architecture and Culture, 3, 371-381. Wagaman, M. A., Keller, M. F., & Cavaliere, S. J. (2014). What does it mean to be a successful adult? Exploring perceptions of the transition into adulthood among LGBTQ emerging adults in a community-based service context. Journal of Gay & Lesbian Social Services, 28(2), 140-158. Meadows, E. (2018). Sexual health equity in schools: Inclusive sexuality and relationship education for gender and sexual minority students. American Journal of Sexuality Education, 13(3), 356-370. This entry was posted in Emily Meadows and tagged cisnormativity, language, LGBTQ, Transgender. Bookmark the permalink.